Something which has had me puzzeled for sometime now. On the cover of the Flag Bulletin XXIV:2/110 (March-April 1985) appears a photograph of a procession of people with a striped flag in the backround. I can find no mention of this picture within the covers. My first hunch is that the gentlemen with the top hat may be Paul Kruger! Also tempted to think that the flag is that of the Oranje Vrijstaat from Anglo-Boer War conflict, but then I could be way off-base here as I don't see Dutch flag in canton. One thing for certain is that it is Dutch-related, alright. "Vrede op....??" being enmblazoned across the heading. Any ideas? A guess: in 1900 Queen Wilhelmina personally sent the destroyer De Gelderland to Lourenço Marques, which collected President Kruger and brought him to Europe. This photo looks Hague-like, perhaps a meeting of Kruger with Prince Hendrik, the Queen's consort. The flag is too vague for me, and I can't see what is written on it apart from what you saw. The cover photo is explained on page 59, in the closing section of the article "Symbols of Peace and Pacificism: The Peace Flag" (pp. 50-59) by Whitney Smith. Earlier in the article the good doctor described the Peace Flag designed by Henry Pettit for use at international Peace Congresses- "a square peace of white silk, in the center of which shall be placed the national blazon peculiar to the country where the Peace Congress shall be held" (pp. 51-52). The word denoting "Peace" in the local language could be added. Later the flag pattern came to be adopted for use by national pacifist societies regardless of whether or not they hosted an international congress, and a gold border was added in cases where the national flag had white at the edges. Also sometimes pacifist slogans, rather than the single word, were added. 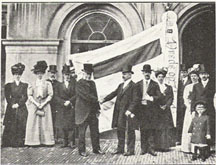 The cover photo shows "members of the Auxilliary Reception Committee of the Arbitration and Peace Congress of America presenting a peace flag to the inter-parliamentary group in the Dutch Parliment, at the door of the Second Chamber at the Parliament Building (The Hague), 9 July 1907. The flag is the Netherlands national re-white-blue with a border of white; the pole is surmounted by a large white cockade and a cravat inscribed VREDE OP [?AARDE]--"
"The cover illustration of this issue shows members of the Auxiliary Reception Committee of the Arbitration and Peace Congress of America presenting a peace flag to the committee of the inter-parliamentary group of the Dutch parliament, at the door of the Second Chamber at the Parliament Building (The Hague) 9 July 1907. The flag is the Netherlands national red-white-blue with a border of white; the pole is surmounted by a large white cockade and a cravate inscribed VREDE OP [?AARDE] - (Peace on [Earth])"